The firearms industry is constantly tripping over itself to provide you the most cringeworthy pseudo-shock content, selling low hanging fruit to people who under-estimate the gravity of violence. It seems perfectly reasonable, then, that after the gun-bunnies, the next step is to start including children. Like anything, there's a right way, and a wrong way, to do that. First let's talk a little bit about children. Until they reach adolescence, a child's concept regarding the permanence of mortality is undeveloped. They (thank God) just don't understand mortality. So when you see guys dressing their 8 year olds up in kit and giving them a .22 caliber AR to practice tactics with, they might as well be trying to teach that kid Calculus... but screwing up an equation doesn't cost you your life. 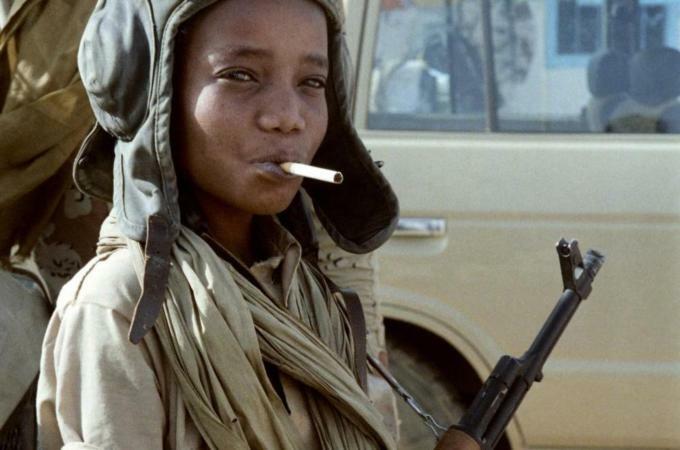 Child soldier in Darfur. Children have long been used to fight wars due to their expendability, lack of compunction, and failure to recognize danger. The word "infantry" itself comes from the latin word for youth, Infantem. Training kids to fight with guns before they can understand the ramifications of taking lives is a dangerous misrepresentation of the severity of taking up arms, and puts the child in control of violence they simply can't comprehend. They're not mentally or physically equipped to shoulder the demands placed upon a person by physical violence. You can discuss topics that are 'scary' with children without terrifying them. They're little humans, and have some ability to rationalize and assess danger. We don't want to swing so far in the opposite direction that people assume we mean to say "shelter your children from the world and let them live fantasy lives." That's just as damaging. Bottom Line Up front: Our position is that training your children to understand the threat of violence is wholly separate from teaching them to use violence. In the same way we wouldn't teach a kid to cook if they had no concept of 'hot' or 'cold', teaching a kid who's mentally and emotionally undeveloped to don a chest rig and blaze away with their .22 caliber AR is giving them all the ingredients and tools to cook, with no real concept of how easy it is to burn your house down and get your family killed. We forget those things as adults, because we *do* have an idea of how easy it is to die. It is from this perspective that we will approach teaching children about guns and violence. While a cute way of phrasing the question, our children are the manifestation of all the our forebears who survived before us, and by way of their survival, contribute to the hereditary legacy that is your child. We'll discuss this more in other articles, but give it some cursory thought now. "When you protect your child, you're protecting the success of your ancestors who came before you. This is a powerful concept, and well-worth considering." While we don't believe children have the capacity to understand the severity of life or death, they absolutely can be taught - from a very young age - about some of the topics surrounding it. A basic understanding of what keeps people alive, for example, such as the ABC's of rescue medicine*, or the basic rules of firearms safety and marksmanship are within the cognitive grasp of most children. Lock up your firearms. There's no excuse for leaving a minor unrestricted access to firearms until they can, without fail, demonstrate safe handling and knowledge. Positive reinforcement and a training pistol can be used to teach children the way to responsibly react to encountering firearms. What's important is to familiarize them in a realistic way, using language they can understand and set the example. Most children will also emulate what they see. As such, it's important to both emphasize to them that guns cause injuries, and demonstrate strict discipline in terms of muzzle awareness, trigger discipline, and practice verification of safe and clear. We get it: this is Fudd stuff and it's uncool, but for all the jack-wagons posting memes about how there were no firearms accidents 50 years ago and complaining about Fudds, they're the reason there weren't accidents. They took discipline around firearms seriously and the results reflected that. Additionally, teaching children how to hunt for their own food, respect the lives they took, and do so sparingly instills wisdom and value in children. Try to make this a part of their upbringing. Understanding food and where it comes from is one of the first steps in developing a healthy appreciation and respect for life (both your own and those we take to continue living) without going to extremes. So while some of their tactical practices are outdated and irrelevant, at least give them credit where it's due. Instill respect for firearms in your children. If you don't, TV and video games will instill ignorance and curiosity. Various physical and mental challenges appropriate for the age of your children. Should they learn marksmanship? Yes, absolutely. Is that all you have to offer them? We sincerely hope not. As we say often, the citizens most likely vector of violence is social/interpersonal; that means it's egos colliding that results in some arguing or light violence. Often, even very good training falls short of preparing a parent for the problems that lead into these situations. Worse yet, any attention that's given this problem mainly just addresses what the parent can do. They have a natural desire to de-escalate so their parent doesn't get hurt. That makes sense. The parent dies, they die. They want to be close to the parent. Again, this makes sense. If there's danger, the farther they are from their lifeline, the less certain their survival. When we add children, our options drastically diminish. Whereas you might tell a panhandler to F*** off on a normal day, if you've got a little one on your shoulders and another by the hand, do you wanna risk a prolonged social interaction, or worse, a fight? What if the guy sees you can't throw hands and decides to pop your jaw for you while you've got a kid on your shoulders? The drop from 5 feet to the concrete can kill a man. It can kill your child, too. So, again, let's move back to why we talk humility. Life here is a 'for granted' thing. Most of us are not overmuch familiar with losing people we love to random violence or depravity. In most of the rest of the world, life is far cheaper and the more people there are, the less one person matters. You absolutely have to have back up plans for interacting with "unknown contacts" (Thank you to Craig Douglas for the concept of Managing Unknown Contacts). This might be verbal judo, avoidance, or pre-planning, but don't expect that your child will just cooperate with what you want. When they get scared, they're going to want to be right there with you. They're walking while holding your hand? What about the child's age? There's a drastic difference between a 2 year old and a 4 year old - not so much between a 14 and 16 year old. How old is the child? At what age do you start changing the approach and letting them move on their own? How about if you have two or more children? How do the circumstances change if your spouse or significant other is there, vs if they're not? How does having an armed or unarmed spouse change your plan? Here's the reality: you don't have much choice anymore. Your decision tree is limited to flight, or fight, which simplifies the situation in some cruel way... because as your options narrow, the stakes widen. This is a LIFE OR DEATH ISSUE for your family. There's no do-over, no mulligan, no resetting the stage or timer. You screw up, they're dead. Your first and only real priority is protecting your family. While this may sound cruel, other people need to fend for themselves - at least until your family is safe. Think about this beforehand. We hear people talking all the time about being hyper-vigilant, sitting in the back corner, scanning strangers for guns and stuff. That's useless. What you think is awareness is really just observation. Awareness facilitates action. Observation helps you make informed decisions. Controlling the environment when you're in your home, vehicle, or place of business is what we need. Awareness allows us to see vulnerabilities, and block them off before they're exploited. So let's try and make this as easy as possible and say that if your children are with you, your number 1 goal should be "distance from chaos". If it's interpersonal, like someone hitting you up for money, just keep some $1's around, shut them up when they start asking for your address to send it back to you when they get home, and roll your eyes when you see them eating Wendy's later. While you might principally disagree with giving handouts and talk big about the idea of 'rolling over', change your perspective. You're buying a cheap solution because you weren't able to avoid the problem in the first place. It happens. Look at people as if they were cars. When you've got kids, you naturally tell them to watch out for cars. Think of people the same way. Avoid people who give you a bad vibe the same way you'd watch out for reckless drivers. Kids and dogs naturally trust or mistrust people, so start encouraging that at a young age, and be receptive to what makes your child uncomfortable. Run and get off the X. Things happen fast, regardless of whether it's a terrorist attack or a hold up. Be aware of secondary attackers and devices. Awareness means thinking about where an adversary would try to trap before they try it. If you can't move your children, hide them. If you can't hide them, get hands on, and move them behind you at an oblique angle (off to the right or left). The goal here is to shield them from an attack, but not put them in a position that if you lose your balance you collapse onto them. Be wary and don't let your children out of your sight. Far more likely than a physical assault while you're holding your child is an abduction or accident (such as being struck by a car). Prioritize rationally. If you're not out looking for trouble, involved in drugs or gangs, your most likely trouble spots will be places that masses congregate and you'll be an incidental target. Your child is probably at greater risk while you're not there. Discuss the realities of violence with them as they age. To begin with, our complications above will shape how you address these issues with your children. Their age, maturity, risk factors, and so forth prevent a 'one size fits all' template, but no matter how you cut it, it starts with teaching. Teach them about the threats they face from abduction, grooming, bullying, cyber threats, and introduce them to instinct and judgment. Don't force them into guilt for not liking people, not wanting to give hugs, or avoiding certain people. Don't shy away from explaining to them that violence happens, because let's face it: if it does, it's unlikely you'll be there to protect them. From a young age, children can start understanding simple concepts in First Aid, such as the role of blood within a closed system, breathing and circulation, and how to call for help. This is entirely appropriate from 4 years of age or so on. Depending on the child, you may even be able to introduce tourniquet application. Expect that they'll forget, and quiz them on some of these things from time to time. You'll see this pay dividends when they're older. Next, get them physically active. Regardless of their level of interest in self protection or wound treatment, a solid baseline of athleticism will improve their chances in any situation throughout the duration of their lives. Martial arts can be a great way of doing this, but each child is different. Hiking and Mobility are as well, as they familiarize the child with overcoming physical obstacles. Reinforce success and interest, even if it's not yours. Teach them warning signs, drill them on reactions for emergencies, and teach them critical thinking. This can start out with things as simple as home fire or earthquake drills, and progress to more difficult tasks, such as having them plan for emergencies when their parents aren't around (such as school violence). Entrust them with jobs in your emergency planning, such as attending to family pets, or being in charge of their own backpack with some basic provisions in it. We're establishing a trend to arrive at our main points here: being capable when violence unfolds isn't about how well you shoot a gun. It's about how much experience you have under pressure. Pressure test your children by slowly exposing them to realistic scenarios that they themselves can process and make decisions about. Doing this will create children who have mental flexibility, some familiarity with thinking for themselves, and the physicality to respond. - 0-3 - Teach them to stay close and test their ability to pay attention. Play memory games with them - even with simple things like toys and stuffed animals. Focus on identifying letters, numbers, and features. Quiz them on the names of people and places, and reward them for doing well. Positive reinforcement for these tasks works wonders, keeps your child's mind busy, and is really pretty fun. Just remember, EVERYTHING is new to them. - 4-7 - Discuss human biology and how we become injured, heal, and how our major systems work along with arithmetic and literacy. Teach them about guns, the rules of safety, and to avoid handling weapons and get an adult. Teach them about the risks of various types of emergencies and rehearse plans, establish meeting points and contact numbers. Don't shy away from showing them injuries, especially if it can be used to illustrate dangers and/or the process of healing. We tend to want to shelter our children from injuries and violence... you don't have to be morbid, but explaining it to them will help them overcome the "freeze" response if they're confronted by trauma. Keep testing their minds and having them remember addresses, phone numbers, etc. - 8-12 - Teach the basics of marksmanship, First Aid, and some Fieldcraft. At this age, they won't be suffering through it as much, and will start to really understand the concepts. Encourage physical challenges and athleticism (martial arts work great). Teach them primitive skills, camping, and how to address the "Rule of Threes". This can be a good time to incorporate security and lock work - but pay attention to the kids maturity. A mild disposition is probably fine, but let them get precociousness out of their system before teaching them things that could get them in trouble. They should be able to fish, start a fire, and cook their own food by this age, and once they do, it'll forever change their outlook (for the better). - 13-18 - Delegate responsibilities to children in this age range. Get them their own equipment that they're responsible for, teach them to use it, and give them opportunities. Have them be responsible for younger siblings, teach them the importance of angles and observation in defensive situations, start teaching them how to use light discreetly. Give them responsibilities when camping and such to have them develop their skills. Get them driving safely. Work in handgun marksmanship and rifles while standing, moving, and more complicated shooting strings, as they become ready for them. Teach them the basics of escaping illegal restraint. This is a rough guide based on the kids in our family and what's worked for them. By the mid teens (14-15) children are far more capable of working problems than people think. Rely on them. If you give them challenges that interest them, they'll be eager to meet them and demonstrate that they're valuable members of your family. Give them the chance - but do so in a way that minimizes the cost and probability of failure (Don't be a jerk, help them, and match the task to their level of skill). Yes, at 4 a child can understand trigger discipline. Now we've talked a bit about mitigating risks and realistic expectations on how your child can face some of these threats, what's next? In short: A lot. As we go forward with this series, we're going to discuss how children present challenges during conflict; not only are they a physical manifestation of your vulnerability, but they tend to want to help, intervene, and stay close to their parent... a very dangerous habit. Furthermore, much of what they're taught in dealing with violence in public places is for accountability, not survivability. If there are two parents, the parent most capable of fighting puts distance between themselves and the attack, drawing attention from the family members (assuming you can't just escape outright) while the second parent moves the kids to safety. Split the attackers attention if and when possible. If the parent is alone, getting the children to safety as quickly and efficiently as possible. If there are multiple children and a single parent, begin rehearsing and instructing the older child's plan to take the younger child to a safe place. This means we need to impart on our children the difference between cover and concealment, no different than we'd teach them about a hot doorknob in a house fire. In our next article in the series, we'll discuss some of the tactics and training methods we can use to instruct children, and even more important: teach them how to react when we aren't there.